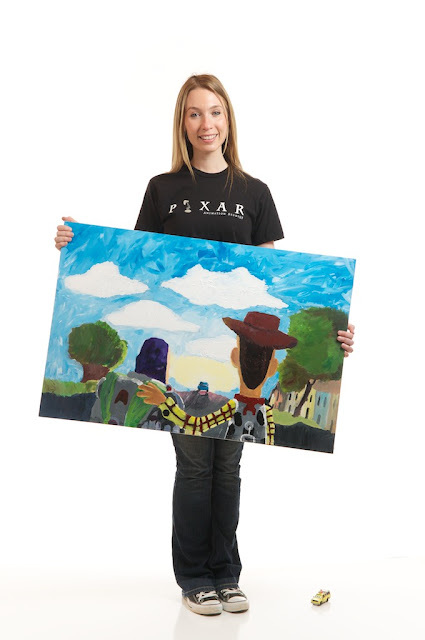 I like to think of myself as a semi-artistic person and I look to Pixar to drive my creativity. With that being said, I'm about to share one of my works of art. This painting was inspired by Toy Story 3 - the final scene of the film. Now there are a few artistic flaws in this painting; such as the "Tree of Life" (from Disney's Animal Kingdom) that appears on the left side of the painting. That was a mistake that just added humor to the painting, so I kept it. You may also notice that Woody's ears are a little, well...crooked. I blame that on tilting my head when I paint. Either way, I love my painting and I hope this inspires you to create your own works of art. Next up - La Luna painting, inspired by Enrico Casarosa's original watercolor of the moonlight ocean.